Here are some charts from Charles Rault, Cyceon’s CEO, which aims to provide you with less formal day-to-day updates about global markets, stock trends and so on. Click here to connect with Charles Rault on LinkedIn. 11/29/2018 – Market – Take the day off (D1) and see the week on (W1). Indeed, the French index CAC40 is still in very hot waters, testing again a major support around 4940-4925. Two scenarios then, one with the support playing its role of support and sending the CAC up for a Christmas rally, another one with the support turning into a resistance and sending the CAC down the hole for an ugly start of 2019. 11/28/2018 – Oil – Many including US President Donald Trump think that lower oil price is good for America’s economic growth and businesses; however some contradict by asserting that it negatively impacts the US oil sector that has managed to become the world’s leading oil producer, ahead of Russia and Saudi Arabia. 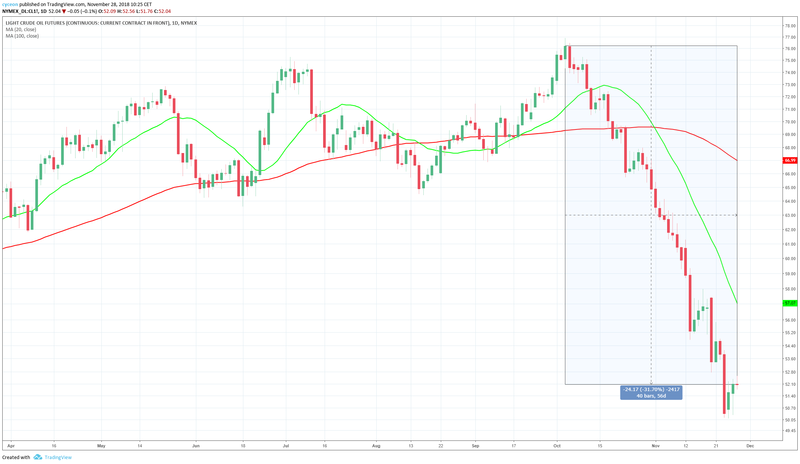 From a technical analysis standpoint, oil price (Light Crude Oil Futures, CL1) dropped 31.70% since October 3, 2018. 11/27/2018 – France – Tensions between French President Emmanuel Macron and the « Gilets Jaunes » who oppose his 22% jump in oil and gas taxation are running high and might be far from ending. Indeed, both political and people reactions to Macron’s proposals here in France have been largely rejected as inadequate if not utterly disconnected. Economy Minister Bruno Le Maire underlined that the demonstrations across the country which have been taking place for two weeks do impact the economy negatively, taking its toll especially on retail and small shops. France’s political situation has never looked so tense in decades. 11/26/2018 – Market – Around the world wide web of stock markets commentators – both professional and non-professional – a consensus has started to emerge, emphasizing that the US market is not undergoing just a correction, but is increasingly looking bearish. Famous CNBC’s Jim Cramer shared a similar viewpoint as he described today’s bounce as just one more sign that the bear market has come while winter is coming.